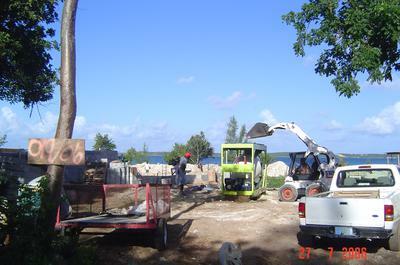 In addition he could not get the consistence concrete strength that was demanded for the project. Using the C.U.B.E. 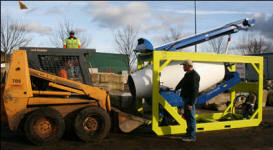 he can produce over 15 yards a day and has completed cylinder tests to find a consistent 3800 PSI in 8-days. 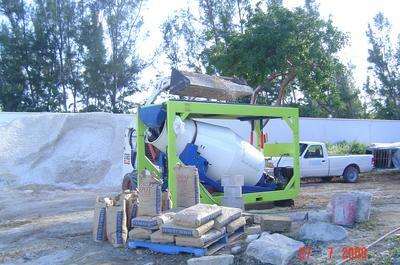 “The only way we can get concrete on this small island is by mixing it by a smaller machine. I get 15 yards per day with the Cart-Away C.U.B.E…. I could never do that with a 1/3 yard Machine”. His mix design includes 9 bags of Portland cement , two tractor buckets of gravel, three tractor buckets of sand and 35-40 gallons water. Return to Share a concrete picture.